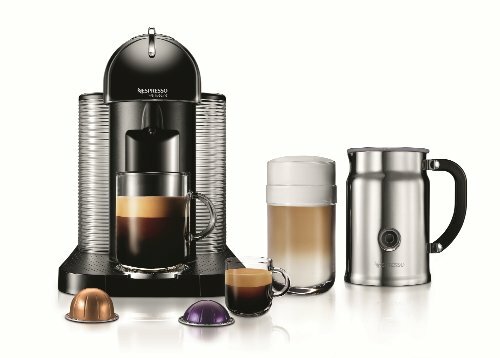 Home » Does the Nespresso VertuoLine Live Up to the Hype? Does the Nespresso VertuoLine Live Up to the Hype? 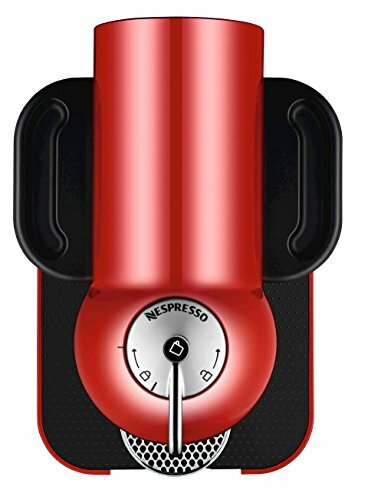 Aimed at the North American market, the Nespresso VertuoLine Coffee and Espresso Maker is a single use capsule machine that is sold as a bundle with the Aeroccino Plus milk frother (also available separately). This one-stop coffee and espresso maker makes a lot of claims, but does it live up to the hype? For those who want are serious about their coffee (and who isn’t? 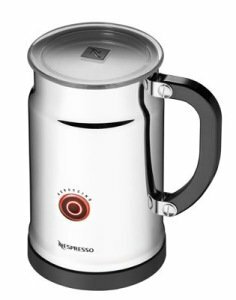 ), but still want single use capsule convenience, I go through the pros, cons, and must-have features of the Nespresso VertuoLine Coffee and Espresso Maker for you! The VertuoLine features so-called centrifusion technology which spins the capsule with water for up to 7,000 rotations per minute to optimize the results. Additional features include single top-mounted button operation, adjustable cup height, and a 40oz removable water tank. It also benefits from automatic pod ejection and used capsule storage. The VertuoLine can dispense both full 7.7oz coffee and 1.35 espresso servings, with adjustable water volume. Note that this model is only compatible with dome-shaped Nespresso VertuoLine capsules. The machine has a barcode reader that automatically detects which pod has been inserted. The VertuoLine is sold new with a welcome pack containing 12 compatible pods (8 large and 4 espresso). Before getting into what the Nespresso VertuoLine can do, it’s worth pointing out some of its limitations, which may prove a turn-off for some potential purchasers. Firstly, it can’t dispense plain hot water for making tea etc. Maybe more importantly, it restricts what coffee can be used to Nespresso VertuoLine capsules (it’s not compatible with other brand or even Nespresso OriginalLine capsules). If these don’t factors put you off, there’s much to like about the retro-style VertuoLine. The first of these is the fact it is sold packaged with the handy Aeroccino Plus milk frother for a $50 saving. This brings the full range of milk and espresso-based drinks into your kitchen. 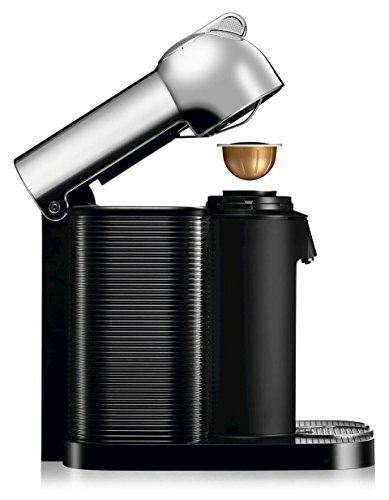 Sold separately, the Aeroccino costs around $100 and the VertuoLine can be bought without the frother for around $200. The VertuoLine also features impressive centrifuge technology that promises to squeeze every drop of flavor out of each capsule by spinning it at 7,000 rotations per minute, dispensing the perfect cup topped with that all-important crema. The VertuoLine is also kitted out with technology that reads the bar code of each capsule and makes adjustments accordingly to get the best out of each Grand Cru blend. A further plus point is the choice of 2 capsule sizes, offering both regular cup and espresso-size servings the touch of a button. The factory presets allow for 7.7oz coffee and 1.35oz espresso sizes, but these can be reprogrammed from 0.3oz to 17oz. In truth, sticking to the 7.7oz factory pre-set results in a pretty weak cup of coffee, so it’s worth adjusting it back to around 6oz if you prefer a more robust brew. The removable water tank holds a respectable 40oz and the VertuoLine features an adjustable cup height. With all this functionality, you might expect the VertuoLine to feature a fancy control panel or array of buttons, but actually, everything is controlled by the single top-mounted button. Settings are changed with a combination of presses and holding the button down. To turn the machine on, press the button. Blinking lights indicate the heating up process is underway (this takes about 15 to 25 seconds). To brew, unlock and open the top of the unit using the lever and insert a dome-shaped VertuoLine capsule (again, no other type will work). Close and lock the head and press the button once more to start the brewing process. If you want to alter the amount of water used, hold the button down until you reach your chosen volume before you start brewing. Pressing the button during the brewing process stops it before completion. Alternatively, you can top off your coffee with extra hot water by pressing the button to turn on and off the flow. As a guide, brewing a full 7.7oz of coffee takes around 1 minute 50 seconds, which is quite lengthy for a pod machine. Once the brew has finished, turn the lever to the right and the spent capsule is ejected into the drawer. The machine is fitted with automatic shut-off after 9 minutes of inactivity, but you can turn it off anytime by holding the button down for 3 seconds. Unfortunately, when it comes to coffee quality, the VertuoLine is not a complete success. The main issue concerns the low temperature of the water (around 150F) for some blends. As indicated above, the VertuoLine has technology that tailors its settings automatically for each different type of coffee blend. While Nespresso is obviously trying to optimize the capsule coffee experience, uniformity of coffee quality is one of the great advantages of owning this type of machine. If you’re investing $200+ in an all-in-one coffee machine, it does seem unreasonable to expect users to blast their brew in the microwave or boil a kettle of water to top up the espresso (not to mention contrary to the idea of having an optimally brewed cup of coffee). As it comes bundled with the VertuoLine, it’s worth quickly mentioning the Aeroccino. This is a standalone piece of equipment that is capable of producing hot and cold milk froth, as well as simple hot milk. Pour in some cold milk (whole or semi-skimmed produce the best results). You can select one of the two whisks – one for hot milk and one for hot or cold milk froth. Press and hold the button for cold froth or simply press and let go for hot. In less than a minute, you can pour your prepared milk directly into a cup or glass. While there are way cheaper milk frothers on the market, the Aeroccino is a handy piece of equipment that’s worth considering, whether or not you opt to purchase the VertuoLine. However, some third party reviews have complained about its durability. The VertuoLine requires periodic cleaning, with each procedure detailed in the user manual. It’s worth reading over the instructions as they take a bit of getting used to. The cleaning procedure takes around 5 minutes and basically involves flushing clean water through 3 brewing cycles. Descaling takes around 20 minutes to complete. The VertuoLine is fitted with a descaling alert. A light will blink alternately 3 times and then become steady when it needs attention. The VertuoLine will stop brewing shortly after the alert until you carry out the full descaling process. Coming up with something new in the world of capsule coffee is a hard task. After all, the very concept of ‘pod in, coffee out’ is pretty foolproof, offering the convenience many of us crave and the variety we enjoy. Made for the North American market, the VertuoLine aims to part coffee lovers from their drip makers by offering both full-size cups of coffee and espresso at the touch of a button. It also employs fancy technology that promises to improve the quality of coffee dispensed. For the most part, the VertuoLine delivers on its promise, but (based on coffee quality alone) it is a stretch to say it in any way improves existing capsule technology. Being forced to buy VertuoLine-compatible pods may well be a deal-breaker for many potential purchasers, whether existing Nespresso fans or newcomers, as it limits one of the most favorable aspects of this type of brewing – variety. Pros: The VertuoLine couples stylish design with the convenience of pod coffee. It benefits from enhanced technological features and the ability to brew both cups of coffee and espresso. The VertuoLine has a simple one-button operation, with adjustable water volume and cup height. This model can be purchased as a bundle with the Aeroccino Plus milk frother (a $50 list price saving on buying the items separately). Cons: Users are limited to using the VertuoLine range of pods and this model cannot produce plain hot water. There are questions over the low temperature at which the coffee is brewed. Maintenance is quite onerous. Brewing a 7.7oz cup of coffee takes just under 2 minutes, which is quite long for this brew method. In a sentence? 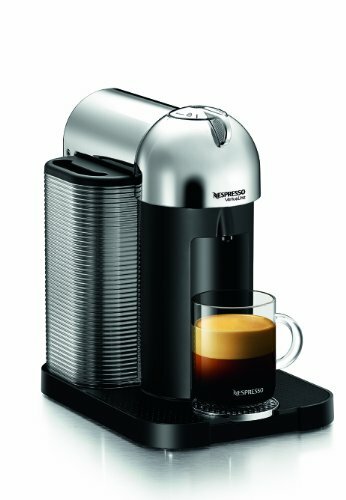 Nespresso has certainly pushed the boat out with the stylish and technologically advanced VertuoLine – but for this price, lovers of pod coffee are likely to feel a little short-changed by its limitations, even though it can be bundled and sold complete with the handy Aeroccino Plus milk frother. I got to the part where you mention the coffee temperature. You know, brewing at a higher temperature extracts a lot more bitter compounds and other things that can give it a harsh flavor. Some brews are good like that while most are better at a more subtle temperature. The reason that most places serve piping hot coffee is because at that temperature, you can’t taste it nearly so well. If you prefer it scalding hot, it may just be that you don’t like coffee as much as you think.